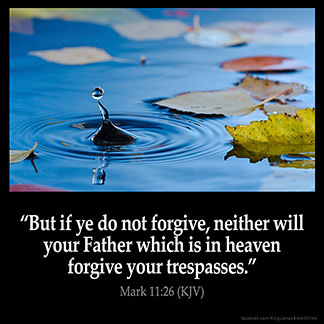 MARK 11:26 KJV "But if ye do not forgive, neither will your Father which is in heaven forgive your trespasses." 23For verily I say unto you, That whosoever shall say unto this mountain, Be thou removed, and be thou cast into the sea; and shall not doubt in his heart, but shall believe that those things which he saith shall come to pass; he shall have whatsoever he saith. 24Therefore I say unto you, What things soever ye desire, when ye pray, believe that ye receive them, and ye shall have them. 25And when ye stand praying, forgive, if ye have ought against any: that your Father also which is in heaven may forgive you your trespasses. 26But if ye do not forgive, neither will your Father which is in heaven forgive your trespasses. 27And they come again to Jerusalem: and as he was walking in the temple, there come to him the chief priests, and the scribes, and the elders, 28And say unto him, By what authority doest thou these things? and who gave thee this authority to do these things? 29And Jesus answered and said unto them, I will also ask of you one question, and answer me, and I will tell you by what authority I do these things. But if you doe not forgiue, neither will your Father which is in heauen, forgiue your trespasses. ["But if you do not forgive, neither will your Father who is in heaven forgive your transgressions.]" And if ye foryyuen not, nether youre fadir that is in heuenes, schal foryyue to you youre synnes.